Moving during the Olympics? Road plan for 2010 Olympics foresees major traffic disruptions! Organizers of the 2010 Oympics unveiled on Wednesday an ambitious transportation plan that involves major road and bridge closures, expanded transit capacity and a plea to the public to ditch their cars and use alternative methods to get around. 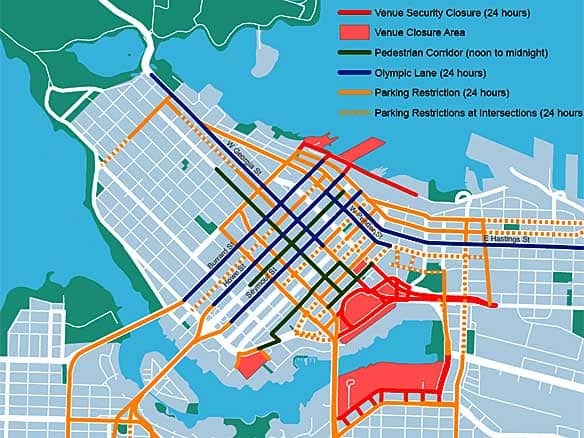 The busiest area during the Games is anticipated to be downtown Vancouver, where Olympics operations are expected to reduce local road capacity by 50 per cent from the east and by 20 per cent overall. Increased traffic into downtown Vancouver will force closures on some major roads, including Expo and Pacific Boulevards, the Georgia and Dunsmuir Viaducts, Quebec Street between Terminal Street and Second Avenue, Canada Place and Waterfront Road. "Olympic lanes" will also be created for TransLink buses servicing high-traffic areas, such as Burrard Street between the Burrard Bridge and Cordova Street, Seymour Street between Granville Bridge and Cordova Street, and Cambie Street from Cambie Bridge to 59th Avenue. The Olympic lanes will be reserved for buses and Olympic-accredited vehicles 24 hours a day, seven days a week. Games organizers hope transit alternatives will allow for a minimum 30 per cent reduction in vehicle traffic, which they say is critical to allow for the smooth transport of people in key areas, such as downtown Vancouver, the Sea to Sky highway to Whistler and Whistler itself. Alternatives to Highway 99 will be set up on Duffey Lake Road to move goods and materials in the event of an emergency. By Games time, public transit around Metro Vancouver will be strengthened to accommodate for the expected increased ridership. The rapid transit Canada Line, which organizers are counting on to carry 5,400 passengers per hour from downtown Vancouver to Richmond and the airport, will be up and running for extended hours. A 30 per cent increase in SkyTrain cars during peak hours will be implemented and a third SeaBus will be added. Specific Games-time additions include the availability of 180 extra city buses, additional runs by the West Coast Express train and a free Olympic streetcar that will connect Granville Island with the Canada Line. Navigating to and from Whistler, where the road network is limited and where the overnight population is expected to surge 10 to 20 per cent, will also be a challenge. Plans to mitigate the influx of visitors to Whistler include the introduction of more buses, changes to parking arrangements and active snow clearing on widely used routes. The Sea to Sky Highway and Highway 99 in Whistler will also be reconfigured to allow for two northbound lanes during the morning rush and two southbound lanes when needed. A checkpoint will also be set up north of Squamish on the Sea to Sky Highway to discourage unnecessary car trips into Whistler during peak travel times. Transportation for the Games will be led by the Olympic and Paralympic Transportation Team, which includes the Vancouver Olympic organizing committee, the City of Vancouver, the Municipality of Whistler, and TransLink, the Greater Vancouver transit authority. The transportation team will operate a command centre during the Olympics and will provide real-time transportation updates to the public. The current plan unveiled by the transportation team represents 80 per cent of its entire transportation plan. The remaining details will be announced by this fall.